Objectives: This study used cardiac CT to identify and name the different shapes of individual left atrial appendage (LAA) lobes and identified correlations between the size and shape of the LAA ostium and the volume of the LAA in a population of normal individuals. Background: The anatomy of the LAA appendage has become the subject of current research, because appendage occlusion devices have emerged for patients with atrial fibrillation. The development of cardiac computed tomography (CT) allows researchers to identify and observe cardiac anatomy, including various shapes of the LAA lobes. Methods: This study was a retrospective review of 102 consecutive patients from March 2009 to November 2010 who underwent cardiac CT using the GE 64-slice Light Speed VCT CT scanner. For each patient, the LAA ostium was measured, and the shape of the ostium was observed and described. After the LAAs were reconstructed 3-dimensionally, each LAA was categorized by its shape and number of lobes. Results: No significant difference was observed between the average LAA volume between males and females. LAA appendages with circular ostium (n = 61) were observed to have a larger mean volume than those with elliptical ostium (n = 39). Predictors of LAA volume were identified. The most common number of lobes was 2 (n = 61), followed by 1 (n = 27), 3 (n = 10), and 4 (n = 2). Eight unique LAA morphologies were identified and a name was assigned to each morphology. Based on the shape and number of lobes observed, the most common LAA lobe shape was hook (n = 55), followed by wing, arrowhead, flame, double wing, finger, sea horse, double hook, knob, spiral, and double knob. Conclusion: This study used 3D cardiac CT to identify and name the morphology of individual LAA lobes as one of eight different types. The Beutler-Loli naming system formulates a basis to improve understanding of the complex structure of LAA anatomy and to facilitate a system for researchers and clinicians to communicate more precisely about the LAA. The left atrial appendage (LAA) remains a medical enigma; the morphology of this structure is poorly understood. The LAA is a muscular pouch connected to the left atrium (LA). The LAA has a complex, multi-lobar structure in some individuals, while in others it contains only a single lobe. The LAA is the original embryologic structure that acts as the LA. The LAA forms during the third week of gestation and is later displaced by the fully developed LA. This occurs as the smooth walled pulmonary veins form from the LA and the trabeculated tissue that forms the LAA migrates anterior and laterally  . This results in a smooth-walled LA and pectinate muscle lining the LAA  - . The anatomical position of the LAA is anterior and lateral to the left pulmonary veins on the LA. The LAA function in the fully developed human heart is involved in hemodynamic and neurohumoral regulation   . The LAA is clinically significant, because it is a nidus for thrombus formation in patients with atrial fibrillation and atrial flutter. These thrombi may lead to eventual embolic events with dire consequences, such as strokes and arterial occlusions in other organs. The anatomy of the LAA appendage has become the subject of current research because of the emergence of appendage occlusion devices for patients with atrial fibrillation. Previous studies have laid the ground work to understand the LAA anatomy  - . The development of cardiac computed tomography (CT) provides a unique perspective of cardiac anatomy. Contrast studies allow for the three-dimensional (3D) reconstruction of the heart, which enables investigators to better visualize the anatomy of the LAA. Cardiac CT allows clinicians to visualize the shape and size of the LAA orifice and permits 3D reconstruction of the LAA to quantify the number of LAA lobes, to observe a 3D analysis of the shape of the LAA lobes, and to accurately measure the LAA volume. The purpose of this study is to use information obtained from cardiac CT to describe the anatomy of the LAA and to observe and classify the various LAA lobe shapes. This study used cardiac CT to analyze, describe, and name the morphology of individual lobes of the LAA. Study design. This study is a retrospective review of 102 consecutive patients from March 2009 to November 2010 who underwent cardiac CT at Biltmore Cardiology, a large private cardiology practice in based in Phoenix, AZ with 13 Cardiologists and four satellite offices in central Arizona. The study was approved by the Banner Good Samaritan Medical Center (Phoenix, AZ) Institutional Review Board. All HIPAA regulations were followed. Inclusion criteria. The 102 research subjects were age 18 and older and had outpatient coronary CT exams to screen for coronary artery disease (using the GE 64-slice Light Speed VCT CT scanner). The standard coronary CT protocol was followed. All of the patients had baseline normal sinus rhythm and none had known structural cardiac defects. All coronary CT studies were routinely stored by the practice. A master subject list during the study period was generated. Data collection forms were used. A unique patient number starting with number one was assigned to each individual that correlated to the master list. The age and the gender of the patients were recorded. Exclusion criteria. There were two CT studies with motion artifacts which prevented accurate 3D reconstruction that were excluded from the study. (where diameter 1 is axial ostium diameter and diameter 2 is sagittal ostium). The LAA orifices were described to be either “circular”, if the absolute difference between the axial and the sagittal diameters was less than two millimeters or “elliptical”, if the absolute difference was greater than two millimeters. 3D Reconstruction of the LAA. Once the LAA ostium was identified, the “Create Vessel” application in the “Fast VR” mode was used to reconstruct a 3D image of the LAA. Next, the volume of the LAA was calculated using the volume-calculator function. All measurements and calculation data were recorded on a Microsoft® Office Excel 2007 spreadsheet. The images of the LAA were saved as “bitmap images” and exported to the system’s “archive” so that they could be stored for review and publication at a later date. Classification of LAA lobes. After all one hundred of the LAA had been reconstructed, the images were reviewed by a committee of three physicians who categorized the shapes of the LAA into one of eight different categories. They counted the number of lobes. The computer software allowed for the visualization and rotation of the LAA structures in a 3D axis, which enabled the reviewers to thoroughly assess the structures. After thirty of the one hundred LAA were reviewed, researchers narrowed the description of the LAA lobes into one of eight descriptive morphologies. Names were created for each of these eight different shapes: hook, wing, arrowhead, flame, finger, sea horse, knob, and spiral. Each of the remaining lobes was assigned one of the eight shape names for purposes of analysis. If an LAA had two or three lobes with the same morphology, its shape would be described as “double” or “triple”, respectively. The researchers observed that the number of LAA lobes on an individual LA ranged from one to four. Each LAA had at least one lobe that was connected to the LAA base. Any additional lobes were defined as anatomically distinct structures that protruded from the LAA base and projected in different planes or directions from the other lobes. Statistical analysis. SPSS 18.0 (SPSS, Inc., 2010) was used along with Microsoft® Office Excel 2007 spreadsheet for data analysis. Descriptive statistics were used. Continuous variables were reported as means and standard deviations. Categorical variables were reported as percentages. Chi square testing was used for categorical variables. Pearson correlation was used to determine relationships between diameters. Logistic regression was used to determine predictors of categorical outcomes and linear regression for continuous outcomes. T test was used to compare the gender differences. ANOVA was used indentify differences in volume of lobe types and number of LAA lobes. A two tailed p < 0.05 was considered significant. Patient demographics. Patient demographics are shown in Table 1. There was no significant difference in the mean age by gender in the study. There was no significant difference between the average LAA volume between males and females (9.87 cm3 and 9.64 cm3 respectively, p-value 0.716). LAA ostium. The shape of the LAA ostium did not have a statistically significant effect on the volume of the LAA. The circular ostium had an average volume of 10.20 cm3 (n = 61) and the elliptical ostium had an average volume of 9.07 cm3 (n = 39), p-value 0.089. 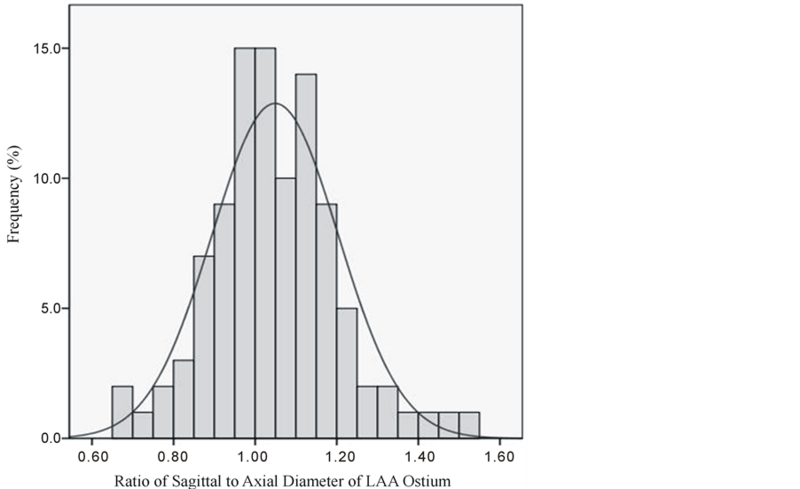 The sagittal diameter of the LAA correlated significantly with axial diameter (r2 - 0.661; p < 0.001) (see Figure 1).The average area of the LAA ostium was 225.1 mm2 with a range of 71.5 - 763.5 mm2. The average area of the circular ostium was 225.0 mm2 with a standard deviation of 92.3, and the average area of the elliptical ostium was 224.7 mm2 with a standard deviation of 124.2. Table 1. Demographics and mean left atrial appendage volume. This table shows the number of male and female subjects used in the study, and the mean age of the males and females. SD = Standard Deviation. p = 0.004 for difference between genders (t-test). p = 0.716 for difference between genders (t-test). Figure 1. The ratio of the diameter of LAA ostium. This figure demonstrates that the sagittal diameter of the LAA correlated significantly with axial diameter (r2 - 0.661; p < 0.001). The bars represent the number of individuals at a given ratio, and the curve represents a near normal distribution of the population. from the base of the LAA. “Knob” is a small, rounded structure. “Wing” is a thin, rounded structure that widens as it projects from the LAA base and appears to have feathers due to the pectinate muscle of the LAA. “Spiral” is similar to hook, but its curvature wraps around on itself. “Flame” is a group of small projections in the same plane that project from the base and are oriented in the same direction. “Arrowhead” is a triangular structure that comes to a point. Figure 3 shows a collection of images of LAA with multiple structures. Of the one hundred LAA’s studied, the most common number of lobes was two (n = 61), followed by one (n = 27), three (n = 10), and four (n = 2). As the number of lobes increased, the volume of the LAA increased with the exception that there was no significant increase between three-lobed and four-lobed LAA’s according to the ANOVA analysis (see Table 2). The most common LAA lobe structure was hook (n = 55), followed by wing (n = 44), arrowhead (n = 14), flame (n = 12), double wing (n = 12), finger (n = 9), sea horse (n = 8), double hook (n = 5), knob (n = 4), spiral (n = 3), and double knob (n = 1) (see Table 3). There were no LAAs that had three of the same structures in this population. When analyzing all combinations of shapes composing the LAA, the most frequent combination was hook and wing—which occurred 28 times. This result occurred twice with one other shape—knob and arrowhead. Figure 2. The Beutler-Loli naming system for left atrial appendage lobe morphology. A. “Hook” is an arched structure that is symmetrical at its midpoint; B. “Seahorse” has the appearance of the aquatic animal and is a double-arched, tapering structure with one arch that is convex and the other concave; C. “Finger” is a straight, tapering projection from the base of the LAA. 1C shows a two lobed structure with a finger and a knob; D. “Knob” is a small, rounded structure; E. “Wing” is a thin, rounded structure that widens as it projects from the LAA base and appears to have feathers due to the pectinate muscle of the LAA; F. “Spiral” is similar to hook, but its curvature wraps around on itself; G. “Flame” is a group of small projections in the same plane that projects from the base and are oriented in the same direction; H. “Arrowhead” is a triangular structure that comes to a point. Figure 3. Examples of multi-lobar left atrial appendages using the Beutler-Loli naming system. Linear regression was performed to identify predictors of LAA volume. Predictors were entered if their univariate relationship to LAA volume had a p < 0.20 (see Table 4). The significant predictors identified included certain shapes (flame, arrowhead and wing), number of lobes, and ostium shape. These five variables were all independently significant predictors of LAA volume when adjusted for the other four. Table 2. Comparison of the number of left atrial appendage lobes and volume. This table shows that as the number of lobes increases, there is a statistically significant increase in the volume of the LAA by ANOVA. Table 3. The prevalence of left atrial appendage lobe morphology structures. This table shows a summary of all of the LAA lobes morphologies identified in the study. Table 4. Linear regression to predict LAA volume. This table shows the results of a linear regression used to identify predictors of LAA volume. The predictors identified include certain lobe shapes, number of lobes, and ostium shape. These five predictors all are independently significant predictors of LAA volume when adjusted for the other four. naming system. Each lobe observed was assigned one of the eight Beutler-Loli categories. The straight forward Beutler-Loli naming system standardizes identification of LAA lobes. Correlations among the sizes, numbers, and shapes of the LAA lobes were then observed and analyzed. Multiple predictors of LAA volume were identified in this study. Three lobe morphologies (flame, arrowhead, and wing) predicted statistically significant larger LAA volumes than the other shapes. Also, as the number of lobes increased from one to three, the volume of the LAA increased. There was not a statistically significant size difference between the three-lobed and four-lobed LAA, likely as a consequence of the small number of four-lobed LAA (n = 2) identified in the study. The LAA with circular ostium had larger LAA volumes than those with elliptical ostium. The average size of the circular ostium, however, was statistically the same as the elliptical ostium. The most frequent combination of LAA shapes was hook and wing—which occurred 28 times. The significance of this association has not been determined. Koplay et al. developed a classification system describing 5 different LAA types which centered on naming the entire LAA by its tip orientation  . This naming classification differs from ours, because we focused on naming each individual lobe by its shape and did not classify the shapes by their orientation. Another difference that exists between our studies is that we isolated the LAA using 3-D reconstruction of only the LAA. This allows us to isolate the LAA from rest of the heart and surrounding structures and to assess the LAA lobes from different perspectives. Di Biase described LAA morphology in patients with atrial fibrillation  . We on the other hand, studied normal patients. Previous studies have laid a foundation for understanding LAA anatomy, but the clinical significance of the vast differences in LAA anatomy that exist between individuals, and the environmental and genetic factors that cause this diversity has not been determined. Similar to other anatomical features of the heart, the variations that exist with the LAA and its lobes likely has some yet to be determined significance. Future research will allow the medical community to understand the significance of number, shape, and size of the LAA. With the classification of the LAA lobe morphology, an improved understanding of the complex structure of the LAA anatomy will be developed. Naming the LAA shapes allows researchers and clinicians to communicate more precisely about the LAA and to more accurately assign and understand correlations between observations and LAA shape. Future research will be needed to identify correlations between the number and types of LAA lobes and normal versus diseased hearts. We would like to thank Dr. Corina Veatch for her contribution in deriving the names for the LAA shapes. No grants or financial support were used for this study. All authors have reported that they have no relationships with industry to disclose. Sadler, T.W. (1990) Cardiovascular System. In: Langman, J., Ed., Langman’s Medical Embryology, 10th Edition, Williams and Wilkins, Baltimore, 165-200. Hara, H., Virmani, R., Holmes Jr., D.R., et al. (2009) Is the Left Atrial Appendage More than a Simple Appendage? Catheterization and Cardiovascular Interventions, 74, 234-242. Al-Saady, N.M., Obel, O.A. and Camm, A.J. (1999) Left Atrial Appendage: Structure, Function and Role in Thromboembolism. Heart, 82, 547-555. Meissner, I. (1999) Prevalence of Potential Risk Factors for Stroke Assessed by Transesophageal Echocardiography and Cardotid Utltrasonography: The SPARC Study. Mayo Clinic Proceedings, 74, 862-869. Ho, S.Y., McCarthy, K.P., Josen, M., et al. (2001) Anatomic-Echocardiographic Correlates: Introduction to Normal and Congenitally Malformed hearts. Heart, 86, II3-II11.